Measure the circumference of any pipe, tree, or other round object with the Perfect Pi Diameter-Circumference Measuring Tape and instantly get an accurate diameter measurement in inches and metric. Our newest and toughest Diameter/Circumference measuring tape. This is a substantial 12ft / 3.5m length steel flexible tape that is a half-inch wide. It comes housed inside a durable and shock-resistant ABS and aluminum case. With a big loop-style endpiece and thick steel blade, this tape will stand up in any environment. The retraction mechanism includes a wheel brake on the outside of the case that spins against the thumb as the tape is extended or retracted, allowing effortless retraction speed control through the application of friction. 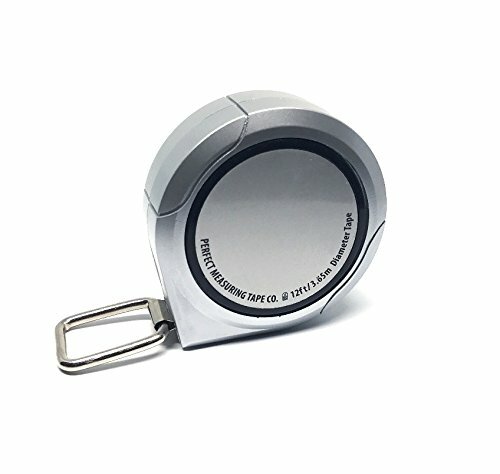 Its high-visibility chrome case is paired with a reflective disc for easy location in dark conditions. Easy-read tape offers much larger numbers against a high contrast white background for simplified measurement readings in low light areas. The top of the tape gives standard length measurements, while the bottom of the tape gives diameter readings down to the millimeter and 100th of an inch. The back of the case has a very strong magnet capable of affixing the tape to metal surfaces. If you have any questions about this product by Perfect Measuring Tape Company - Since 1912, contact us by completing and submitting the form below. If you are looking for a specif part number, please include it with your message.